To really start our Thanksgiving unit. I read the children a wonderful rebus story. For those who don't know, a rebus story has pictures for certain words where the children can help read along. This story is about how the first Thanksgiving began. I have had this story forever, even before I graduated from college. I had purchased a kit from Macmillan, called Macmillan Seasonal Activity Packs. The copyright date on it is 1985. The kit is full of great ideas. 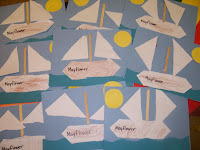 I read the story with the children at circle time then show them that our craft for the day is a Mayflower. My Mayflower is pretty basic. Because of time restraints I have many pieces pre-cut. I pre-cut a square 6 x 6, a sun and some water. You can adapt these with many different items. 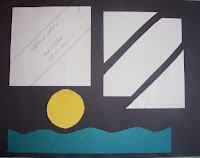 You can paint water and a sun, or use blue tissue paper for the water, I'm sure that imagination can spice this project up. This is another cutting activity I have for them to do. I give them the square with the pattern drawn on it and they must cut it apart. Again, this can take a while depending on scissor skill--not as long as the cornucopia though. First I have them cut the pattern apart. Then they color the midsection brown--this is the ship. The water, sun, and ship get glued on. Then the popsicle stick is glued on and finally they glue on the sails. After all the pieces are together I write the word Mayflower. My goal for this lesson is to have the children learn the Pilgrims came to America o n the Mayflower. The Native Americans helped the Pilgrims settle and learn new things in America. The Pilgrims had a big feast to thank the Native Americans for their help. 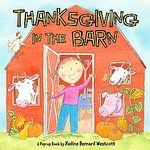 The story we read today was a fun little story called "Thanksgiving in the Barn" by Nadine Bernard Westcott. It is a cute pop-up book where some animals come to join in a Thanksgiving celebration. The children love the pop-ups. I found a picture of the book from eBay, but couldn't find it on Amazon or Scholastic. It looks like the kids are having a great time getting ready for Thanksgiving!! Lots of wonderful projects going on in your classroom. The book you mentioned in this post looks adorable. My four year old loves pop-up books. Take Care!! Oh! I love this idea! Thanks for sharing both the craft and the story.